The widening skills gap is one of the most pressing issues facing field service companies today. While the field service industry as a whole has seen significant growth over the last several years, it hasn't come without its challenges, and one of the biggest questions field service leaders now face is how they are to drive the same levels of growth from a shrinking pool of workers. The Manpower Group conducts an annual talent shortage survey of nearly 40,000 employers across 43 countries to learn more about the impact shortages have on companies. 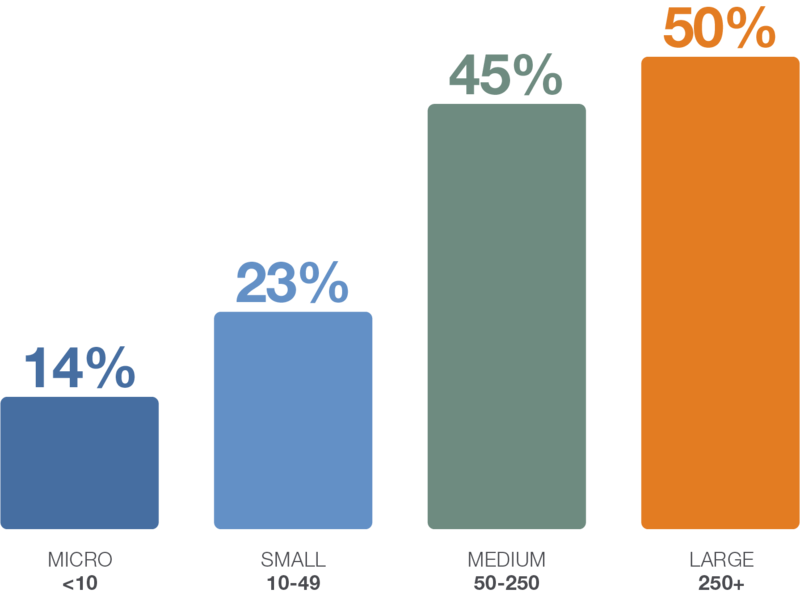 In its 2018 survey, it was found that 50% of large companies (defined as companies with 250+ employees) and 45% of mid-sized companies (those with between 50 and 250 employees) reported having difficulties filling roles. For the sixth year in a row, skilled trade positions (electricians, carpenters, welders, etc.) were the hardest roles to fill, followed by drivers and healthcare professionals. Occupying the fourth and fifth spots were technicians and engineers respectively. As a result, many organisations are reporting a significant impact on their ability to meet client needs, with shortages also leading to reduced competitiveness, lower employee morale, and reduced innovation. 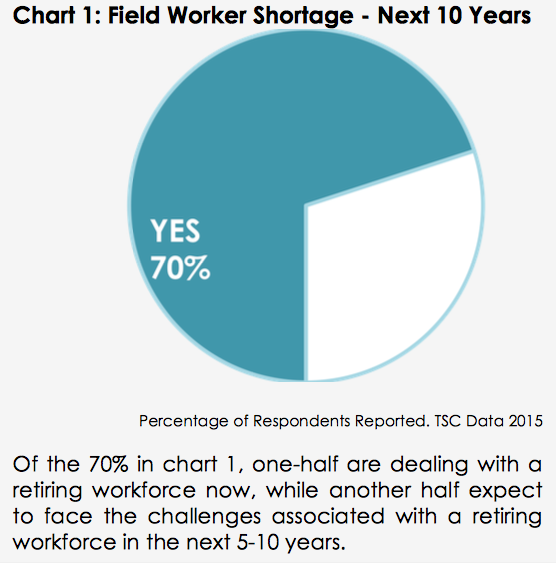 What's Driving the Field Service Talent Shortage? Skills gaps occur when there is a negative difference between the skills that a business needs to perform its daily operations and the talent available in the job market. In the field service industry, a skills gap is occurring due to a number of reasons. One is market growth - as the field service industry has grown, it has led to a situation where demand for skilled workers is starting to outstrip supply. Compounding matters, however, is the growing number of people working as freelancers in the so-called "gig-economy". This combines with the retirement of baby boomers, and the reticence among millennials to train for a career in field service. The ageing workforce is one issue in particular that is affecting many service organisations all over the world. As seasoned and experienced field service technicians fast approach retirement age, there is a shortage of keen young millennials to replace them. According to industry research, 70% of service organisations are indicating that they will become burdened by a retiring workforce over the next five to ten years. In the same study, 50% of respondents reported that they were currently facing a shortage of resources to meet service demand. Combined with too many inexperienced technicians in the field, organisations are experiencing lower productivity, lower first-time fix rates, an increase in customer dissatisfaction, and a negative impact on bottom lines as they pour limited resources into finding, training, and retaining technical talent. By capitalising on employment trends - along with recent advances in technology and service management - there are a number of ways that field service organisations can combat the growing skills crisis. Millennials and the even younger Gen Z have different expectations of the companies they work for when compared to previous generations. As such, in order to attract new talent, field service organisations need to rethink how they can appeal to a multi-generational workforce both now, and in the future. Young people at the start of their careers seek jobs at companies that share their core values of individual expression, personal impact on the world, and personal fulfilment. As such, creating a culture of communication, collaboration and engagement is key to realising a millennial-friendly environment. Loyalty is a problem with the younger workforce when they feel undervalued. Service leaders can attract and retain the next generation of talent by facilitating discussions between older and younger workers, providing ongoing training and education, offering flexible working arrangements, and - most importantly of all - seeking millennials' input in planning processes. The good thing about millennials and Gen Zers is that they are digitally-savvy and keen to adopt new technologies as they emerge. As the field service industry continues to be disrupted by advances in technology - such as the IoT (Internet of Things), machine learning, and data analytics - the young workforce is already well-equipped to use it. But the very act of embracing these new technologies can in itself play a significant role in resolving labour shortages. For example, IoT-enabled equipment and devices can help organisations save time in diagnosing a problem and finding the right parts to fix it - creating greater operational efficiency that enables the organisation to do more with fewer workers. AI (artificial intelligence) can offer a similar solution by enabling predictive maintenance, scheduling, and parts management. In addition, technologies such as AR (augmented reality) programs make it easier for inexperienced workers to gain new knowledge and skills quickly and easily. Learning apps and other mobile learning tools can also be deployed which enable the workforce to look up solutions on the job, and thereby fix issues immediately. Technology can also be used for succession planning and knowledge transfer from one generation to the next. Whether it's providing access to centrally stored information like asset manuals, engineering data, or repair scenarios, or a single system which tracks project dependencies, there is much software available that will ensure an organisation's knowledge isn't lost when experienced employees retire. Many field service management software solutions include functionality such as job aids, workflows, task checklists, and tips and tricks which can be presented in a format that is easily accessible from a mobile device at the job site. These tools can be created with input and knowledge gleaned from seasoned field service professionals who are due for retirement in the coming years. The field service organisations that invest in these types of technologies to support workforce development will be the ones to attract and retain the best talent in the future. As the gig economy trend continues, many field service leaders are turning towards hiring freelancers as part of their strategies to combat labour shortages. The next generation of employable field service technicians is looking for the kind of flexibility and autonomy that a full-time job simply doesn't offer. In addition, retired baby boomers also appreciate having the option to earn a little extra by working freelance. In a recent study by Blumberg Advisory Group and Field Service Insights, it was found that 77% of field service organisation are using freelancers or contractors to handle shortages. In addition, two out of three are using a freelance management system (FMS) to source and manage talent. Users of FMS platforms cite greater agility, reduced costs, faster time to market, and improved efficiency as the top benefits. The widening skills gap is undoubtedly a challenge for service leaders. But it doesn't have to spell disaster for the industry. With the right strategies and investments, the shortage of skilled labour can be overcome - it just requires thought, forward planning, and innovation to do more with fewer people. The impact of impending field service labour shortages is set to be a hot topic at Field Service Europe 2018, taking place this November at the NH Collection Amsterdam Grand Hotel Krasnapolsky, Amsterdam, Netherlands.